This wildflower lacks chlorophyll and is non-photosynthetic. In order to obtain carbon, it forms a parasitic relationship with mycorrhizal fungi that grow on tree roots. Indian pipes are found in rich, moist woods where there is a lot of leaf litter. There is one flower per stalk. The flowers of this plant nod downward until they are fertilized. The flowerhead then tilts back upward when the seeds are formed. The white plant is only 4 to 8 inches in height and has tiny, leaf-like scales that are actually bracts. (Sometimes Indian pipes can be pinkish–see the gallery below.) The plant turns black later in the season. These were photographed at the base of Brush Mountain in Montgomery County. 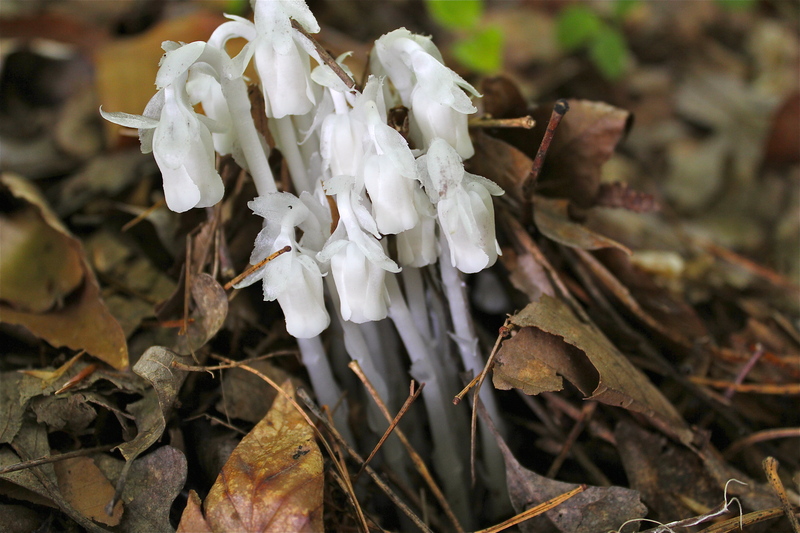 Compare Indian Pipe with Pinesap, which is cream to pinkish-red in color and has multiple flowers per stalk. Once again, AMAZING photos! Thank you!